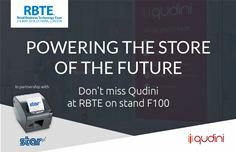 High Wycombe, UK, 24 April 2018 International POS printer manufacturer Star Micronics has today announced that it will be partnering with Qudini, an award-winning London-based SaaS customer experience management company offering queue management and appointment booking software to retailers, at RBTE 2018 (2 – 3 May, Olympia, London) on Stand F100. Qudini is a cloud based platform that allows brands with physical locations to create fantastic customer experiences. This is done through technology to manage queues and walk-in customers requiring service, with additional functionality that allows brands to take booking for appointments and events online. Qudini works with: O2, Telefónica global, John Lewis, Thomas Cook and many other fantastic retailers as well as the NHS and many of London’s hottest restaurant brands, including: Honest Burgers, Hoppers, The Diner and many others.